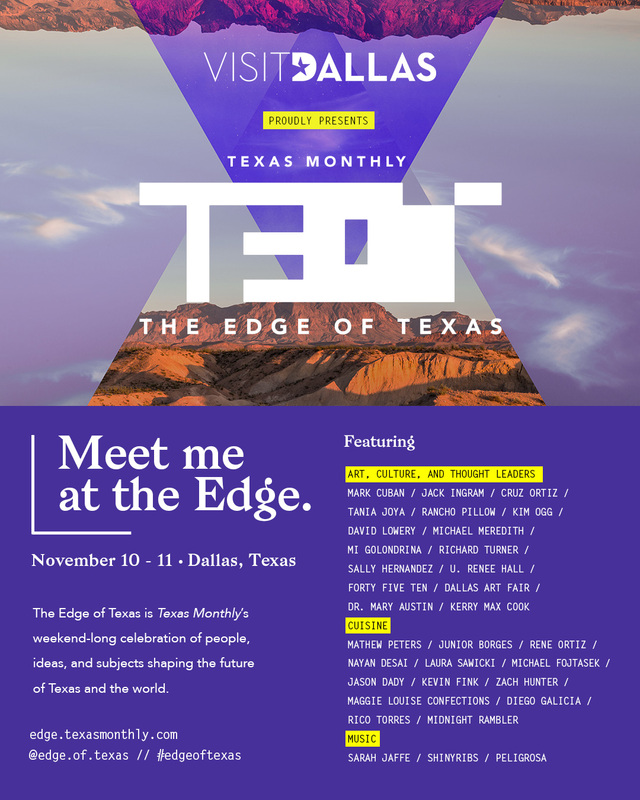 September 13, 2017 - DALLAS, TEXAS - Texas Monthly announces the talent lineup and schedule of events for The Edge of Texas, a weekend-long exploration of the people, ideas, and subjects shaping the future of Texas and the world. Presented by VisitDallas, the inaugural event will be hosted in downtown Dallas on Friday, November 10th and Saturday, November 11th. The weekend will consist of three distinct experiences, including a Friday night kickoff with tantalizing cuisine, cocktails, and music at the Fashion Industry Gallery (807 Ross Ave #167, Dallas, TX); Saturday's day-long event where celebrities, thought leaders, musicians, and artists from around the state will tell their stories and showcase their skills on two stages at The Joule (1530 Main St, Dallas, TX) and The Eye (1601 Main St, Dallas, TX); and Saturday night's mashup of live performances by Shinyribs (Austin) and Sarah Jaffe (Dallas), live fire cooking by renowned chefs, pop-up bars, and a futuristic campfire theme at the Longhorn Ballroom (216 Corinth Street Road, Dallas, TX). To celebrate the release of the event schedule, Texas Monthly also unveils a dedicated Edge of Texas Instagram account (@edge.of.texas) featuring inspiring images and regular event updates. Additionally, for the chance to win access to the event, Texas Monthly will launch The Edge of Texas Contest. Winners will receive a complete Edge of Texas weekend experience with a pair of VIP tickets to all three events, a two-night stay at a Dallas luxury hotel, and a $200 Visa gift card. The Edge of Texas Contest will be open for entries Friday, September 22th through Friday, October 6th at Edge.Texasmonthly.com. The celebration begins on Friday, November 10th at 7 p.m. at the Fashion Industry Gallery (807 Ross Ave #167, Dallas, TX). The evening will be an awakening of the senses with cocktails and cuisine crafted by our state's most creative mixologists and chefs, including the first U.S. Bocuse d'Or 2017 winner Mathew Peters (Austin), Chris Shepherd of Underbelly (Houston), Jason Dady of Dady Restaurant Groups (San Antonio), Junior Borges of The Joule (Dallas), Zach Hunter of The Brewer's Table (Austin), Michael Fojtasek of Olamaie (Austin) and haute chocolates by Maggie Louise Confections (Austin). Bringing to life the vision of leading artists, designers, and culture creators, guests will enjoy innovative spaces, including a lounge by Sheila Youngblood of Rancho Pillow (Round Top), a custom fragrance bar by Forty Five Ten (Dallas), a live art installation and projections by artist Cruz Ortiz (San Antonio), and an interactive bakery and charcuterie pop-up by Headington Companies' Commissary (Dallas). As guests explore the event, they'll dance to the Latin sounds of the DJ collective Peligrosa (Austin) with salsa dancers styled by Mi Golondrina (Dallas). Tickets include cuisine, cocktails, live music, and entertainment at $85 for General Admission and $125 for VIPs. VIP tickets also include valet parking, a 1-year subscription of Texas Monthly and a special gift. Programming on Saturday, November 11th, from 10 a.m. to 5 p.m. at The Joule (1530 Main St, Dallas, TX) and The Eye (1601 Main St, Dallas, TX) will consist of a range of live interviews, exploratory discussions, and immersive experiences on subjects central to the state of Texas, its future, and its place in the world. These sessions will be hosted by Texas Monthly editors, and attendees will be able to choose which sessions they want to experience. Storytelling on the Edge will be as bold and varied as the state of Texas itself. Tickets for this immersive day of storytelling are $150 per person with valet parking and access to the full day of sessions. Mark Cuban has ideas. He has opinions. He prides himself on his ability to see around the technological bend to what will shape the future. In this one-on-one conversation with Executive Editor Skip Hollandsworth, Cuban will discuss what Texas can and should be doing to continue as a leader in entrepreneurship and innovation. In this one-on-one conversation with filmmaker David Lowery, guests will take a cinematic journey across Texas filmmaking with fim clips and discussions on up-and-coming directors while learning about how one of the leading figures in filmmaking is pushing his own work in new directions. Texas is known for its songwriters. Meet the young troubadours who will write the next generation of iconic tunes. Learn about the anatomy of a song and how songwriting is taught. Get an exclusive preview of the future of Texas music, featuring live performances by some of the all-star songwriters of Texas Songwriter U, alongside singer/songwriter Jack Ingram. Featuring Jack Ingram (Houston) and all-stars from Texas Songwriter U including Jefferson Clay (San Antonio), Mignon Grabois (Houston), Benton Leachman (El Paso), and Trannie Stevens (Waco), interviewed by Writer-at-large Andy Langer. The sixties were a turbulent decade for the city of Dallas, including bearing the stigma as the location of President John F. Kennedy's assassination. But the 1960 Dallas Cowboys expansion began paving their way to becoming one of the most popular teams in the world, and it started with a group of players and coaches who would help define a city's image and identity. First Cowboys is a documentary currently in production, telling the story of Dallas in the 1960s through the eyes of the players of its crown jewel - the Dallas Cowboys - and how the legacy of that time shapes the city's sports world today. Featuring Filmmaker Michael Meredith (Dallas), son of legendary Cowboys great Don Meredith, interviewed by Writer-at-large Michael Hoinski. The relationship between a community and the professionals who enforce the laws has always been delicate. Lately, it has been under even more stress. Hear from some of the state's leading professionals about what challenges they face, what strategies they are pursuing to resolve them, and how new technologies could bring more proactive and transparent law enforcement. Imagine your husband dragging your family to Syria to join ISIS. That was the reality Tania Joya faced as a young woman who fled a marriage to one of the most senior American ISIS fighters in Syria. Now she's residing in Texas, studying counterterrorism, and has devoted herself to preventing the kind of radicalization that once seduced her. This is her never-before-told story. For almost 40 years, Kerry Max Cook did everything to clear his name after being wrongly convicted of a horrifying murder in Tyler. So when he was finally exonerated, why did he ask for his conviction back? This session will tell the story of Cook's sweeping saga and allow the audience to explore how to improve our justice system. Featuring Kerry Max Cook (Tyler) interviewed by Executive Editor Michael Hall. Nowhere is modern medicine more advanced than in Texas. From diabetes research to cancer treatment, people flock to the state's medical centers to find the best available care. Meet one of the doctors on the medical frontier, a surgeon who can operate on fetuses in utero to repair or prevent a lifetime of damage. Texas is a hotbed of beer experimentation. Craft brewers abound, and with all the new beers to try, it can get overwhelming. Take a guided tasting tour of the booming Texas beer landscape with three brewers who are masters of their craft. Featuring Texas brewers interviewed by Contributor Aaron Chamberlain. Sixty-two-year-old Richard Turner is renowned as one of the world's greatest card magicians, and the subject of a forthcoming documentary DEALT. He's also blind. See Turner perform his incredible act, then stay for an audience Q&A focused on how Turner manages to push the boundaries of performance art without the benefit of sight. Featuring master card shark Richard Turner (San Antonio) interviewed by Editor in Chief Tim Taliaferro. For the weekend's grand finale, on Saturday, November 11th, at 7 p.m. at the Longhorn Ballroom (216 Corinth Street Road, Dallas, TX), Texas Monthly will re-imagine the Texas frontier with a futuristic campfire theme and a live concert by Shinyribs (Austin) and Sarah Jaffe (Dallas) on the main stage. Live fire cooking will take place outside featuring leading Texas restaurateurs and chefs including Rene Ortiz, Laura Sawicki, and Nayan Desai of Launderette (Austin), Diego Galicia and Rico Torres of Mixtli (San Antonio), Kevin Fink of Emmer & Rye (Austin), Junior Borges of The Joule (Dallas), and Bocuse d'Or 2017 winner Mathew Peters (Austin). Styled teepees will surround the live fire, each with a different narrative by leading Texas artists and designers inlcuing artist Cruz Ortiz (San Antonio), paired with a pop-up bar by Midnight Rambler (Dallas). Tickets include cuisine, cocktails, live music, and entertainment at $95 for General Admission and $145 for VIPs. VIP tickets also include valet parking and a commemorative event poster. Buyers can purchase The Edge of Texas Weekend Pass that includes VIP level tickets to all three experiences (Friday, November 10th and Saturday, November 11th) for $350 per person. All ticket options are available for purchase at edge.texasmonthly.com. The Edge of Texas Weekend is produced by Texas Monthly, presented by VisitDallas, and sponsored by Downtown Dallas Inc., Headington Companies, and KXT 91.7. For tickets and information about Texas Monthly's Edge of Texas, presented by VisitDallas, visit edge.texasmonthly.com. Texas Monthly, the national magazine of Texas, has chronicled life in contemporary Texas since 1973, reporting on vital issues such as politics, the environment, industry, and education. Texas Monthly produces elite journalism across print, digital, and live platforms that captures the unique spirit of Texas and speaks to Texans. The magazine is known for astute political commentary and compelling longform narrative nonfiction. As a leisure guide, it is the indispensable authority on the Texas scene, covering music, the arts, travel, restaurants, museums, and cultural events with its insightful recommendations. Texas Monthly has a reputation for providing its readers with the highest editorial and design quality and has won thirteen National Magazine Awards. For more information, visit TexasMonthly.com.